So, you’re on the hunt to buy the BEST 20″ bike for your child or grandchild. Don’t waste your time–just buy the Woom 4. It’s a lightweight, high-quality, attractive, and durable bike for young kids. 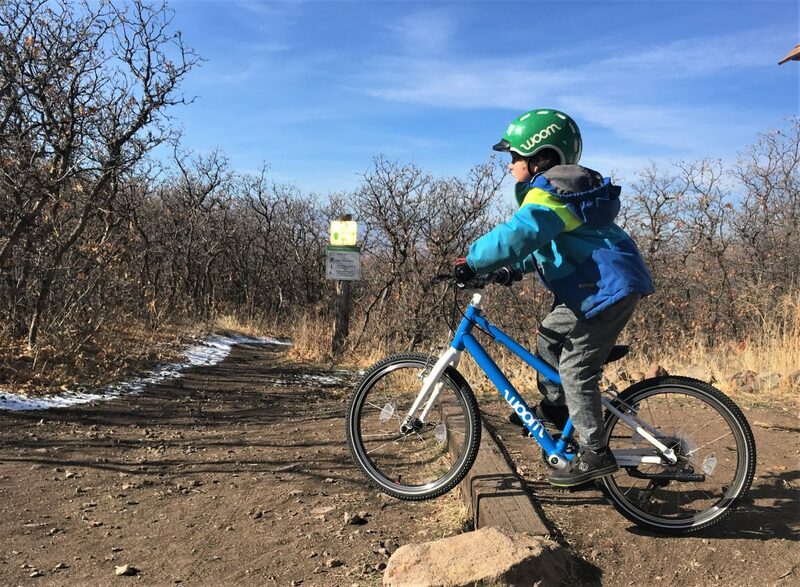 We have yet to see a brand that does a better job of building bikes for young kids than Woom, and we’ve tested a lot of bikes. 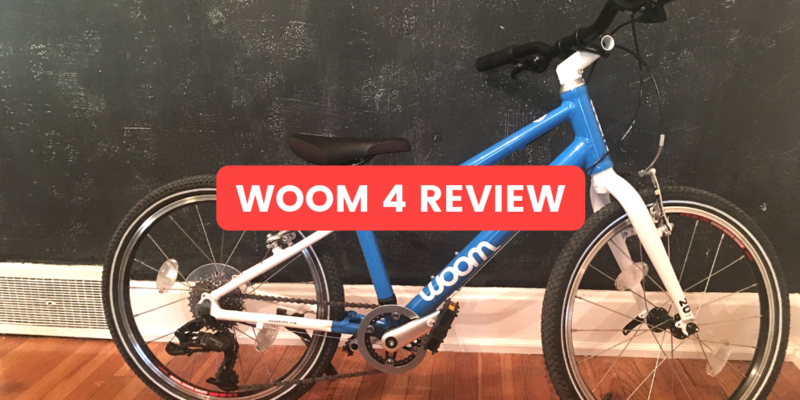 The Woom 4 is well suited for recreational riding, biking to school and around town, and even for longer distance riding. Although it’s not a mountain bike, it does have all-terrain tires which means that it can tackle gravel rail trails and mild dirt trails. On the road, the bike is light enough and has a wide enough range of gearing to help kids keep up and ride long distances. In fact, whatever kind of riding your child is planning on doing, chances are that the Woom 4 is the right bike to help them do it. More than likely, the Woom 4 will be your child’s first bike with gears. Fortunately, the bike’s high-quality drivetrain makes learning to shift easy. 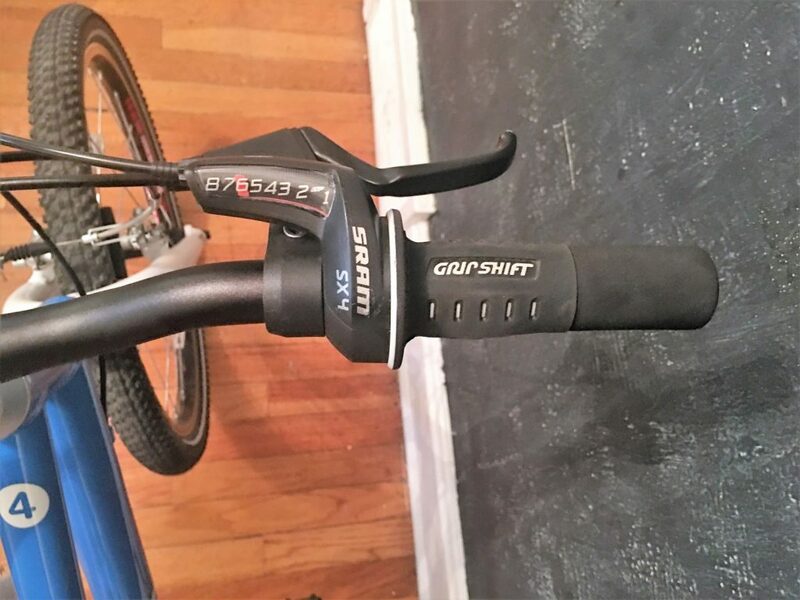 The SRAM X4 grip shifter is intuitive for kids just learning to shift, and the nice big display numbers are easy to read and help kids understand which direction to shift. 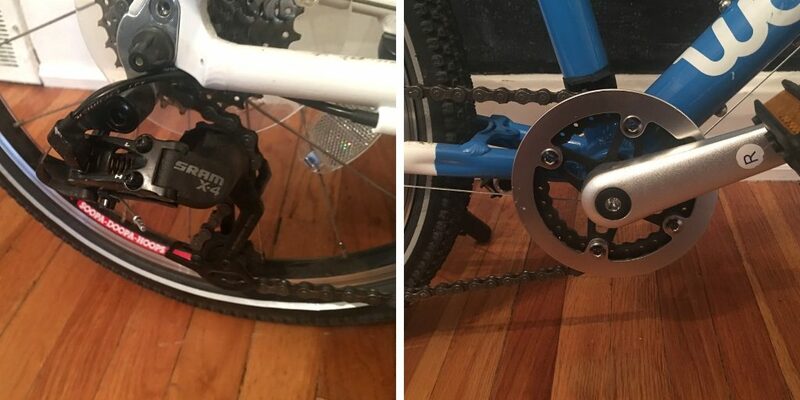 During testing, we did find that while the shifter is easy to shift into harder gears (smaller chainrings), my six-year-old had difficulty shifting back to smaller gears (bigger chainrings). On climbs, he had to stop to shift gears with both hands. I should note that this is not uncommon with twist shifters. In fact, we’ve found that trigger shifters seem to be easier for little hands to operate but harder to learn to use. Fortunately, the drivetrain is finely tuned, and even when shifting multiple gears while stopped (usually a big no-no), the short-cage SRAM derraileur made nice clean shifts. The Woom 4 has an 8-speed drivetrain, with a single 28 tooth chainring up front and an 8 ring cassette in back ranging from 11 teeth to 32 teeth. For the bike geeks out there, that gives the bike a gain ratio between 2.3 and 6.7. Don’t know what that means? It means this: Woom has provided plenty of range both for climbing steep hills and making good speed on flat roads. 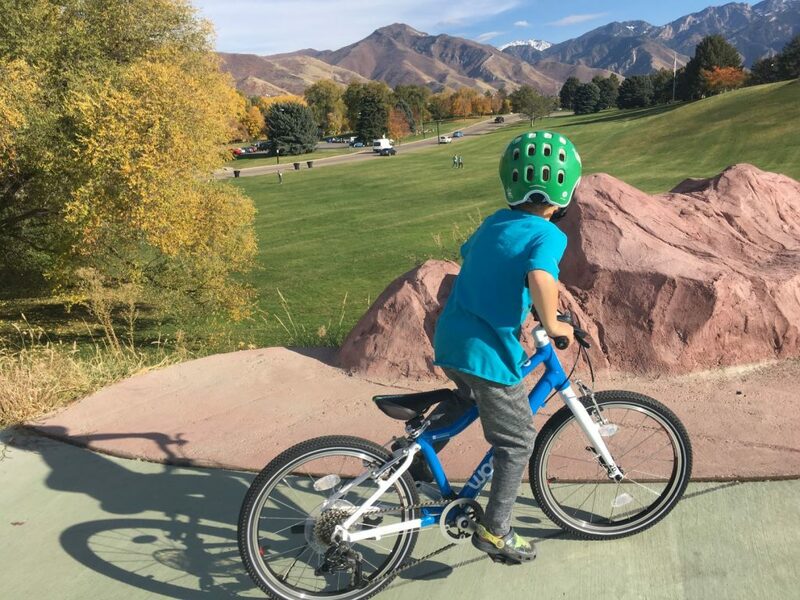 Parents of kids coming from a single speed bike will notice an immediate and marked improvement in how long, how fast, and far their kids will be able to ride. Adding gears opens up a whole new world! 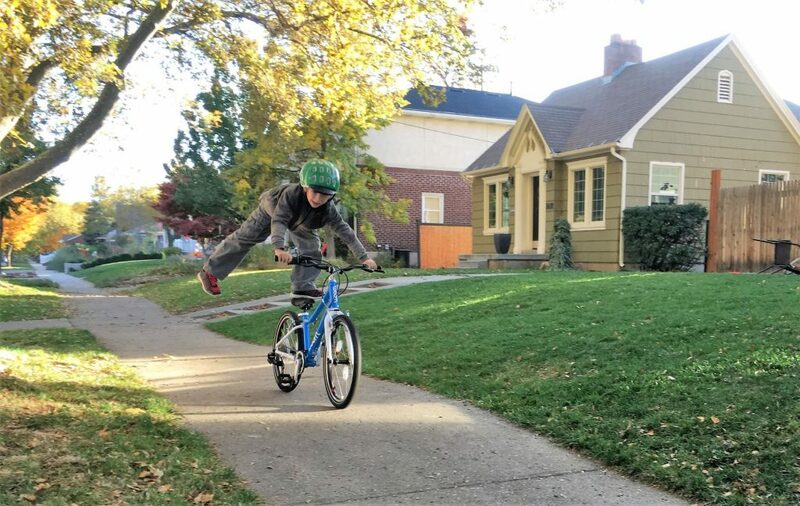 Some kids moving up to a 20″ bike have already mastered hand brakes, while others are coming from 16″ bikes with a coaster brake. For kids who haven’t already mastered braking, the Woom 4 is a good bike to do it on. Like all Woom bikes, the brake levers are appropriately sized for small hands and are easy to operate and pull. 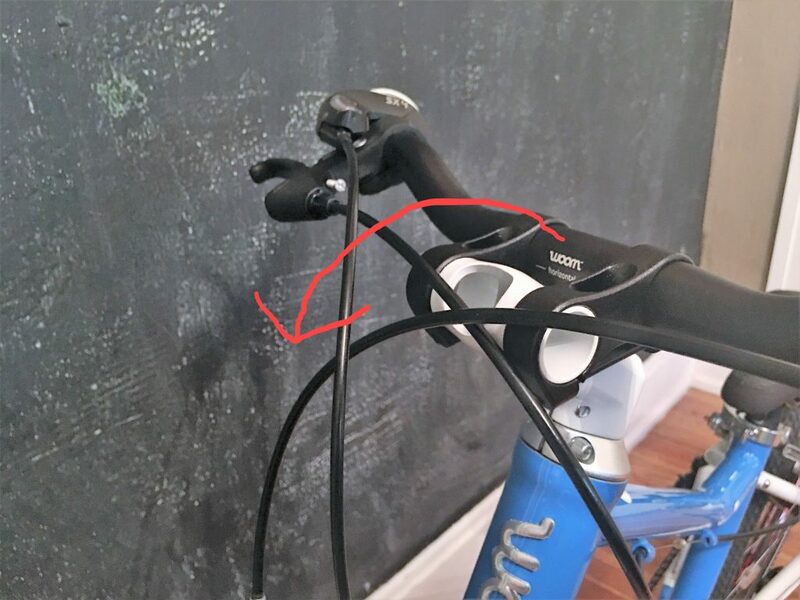 The Woom 4 does lack the color-coded levers of the Woom 1, Woom 2, and Woom 3, which is a bit of a bummer considering I think there are a lot of kids entering a 20″ bike that are still learning braking skills. For more aggressive riders, it’s important to note that the v-brakes provide excellent stopping power. Woom uses high-quality, low-friction Jagwire bowden brake cable, which is the same cable I use on my own commuter bike. At 16.9 pounds, the Woom 4 is one of the lightest 20-inch bikes that we know of. (The only bike that we’re aware of that’s lighter is the Early Rider Urban 3. It weighs in at 16.3 pounds, but also costs $150 more than the Woom 4). Why is weight so important? Kids just don’t weigh that much. When you put them on a heavy bike, it’s like putting an adult on a 70-pound bike. Trust me when I say you wouldn’t like that very much and you probably wouldn’t ride very fast or very far. Let’s do a little comparison to help illustrate this. I personally weigh 125 pounds. My mountain bike weighs 25 pounds and my road bike weighs 19 pounds. That means my bike weight to body weight ratio is between 0.14 and 0.2. My 6-year-old, on the other hand, is barely 40 pounds fully dressed. His bike weight to body weight ratio on the Woom is 0.42. While that’s arguably still pretty heavy for a little kid, it’s significantly better than any other option. On a bike like the Trek Precaliber 20 (which weighs nearly 24 pounds), that ratio skyrockets to 0.6. Ouch! And, big box store bikes are even worse. Don’t underestimate the importance of weight. We’ve seen time and time again: the lighter a bike is, the more fun kids have riding it, the further they can ride, and the faster they can go. Unlike the kids’ bikes of old, the best modern children’s bikes have been designed from the ground up with kids unique needs in mind. Woom has been at the forefront of this design revolution. All their bikes are lightweight, stable, and easy to ride. We’d argue that in terms of geometry, the most important things to look at on a kids bike are the wheelbase (length from wheel to wheel), steering angle, crank length, and q-factor. All are dialed in on the Woom 4. The bike’s long wheelbase provides a stable platform for kids to learn on, the slack steering angle is forgiving, and the short cranks (100mm) allow for efficient pedaling. Speaking of efficiency, we also like looking at the q-factor, which is the width or distance between the pedals. The narrower the q-factor, the easier it is for kids to pedal. As you’d expect, the Woom 4 has an appropriately narrow q-factor. The build on the Woom 4 is both durable and efficient. We appreciate the Kenda Small Block tires, sealed ahead headset, sealed bearing hubs, and lightweight aluminum rims. The quality of the components make for a lightweight bike, durability over time, and an enjoyable rider experience. The Kenda Small Block tires are ones I’ve actually used on my own bikes time and time again over the years. They hit a sweet spot where they are fast-rolling on pavement but can manage dirt and gravel as well. Before getting the Woom 4, we tried out the new Woom size chart. 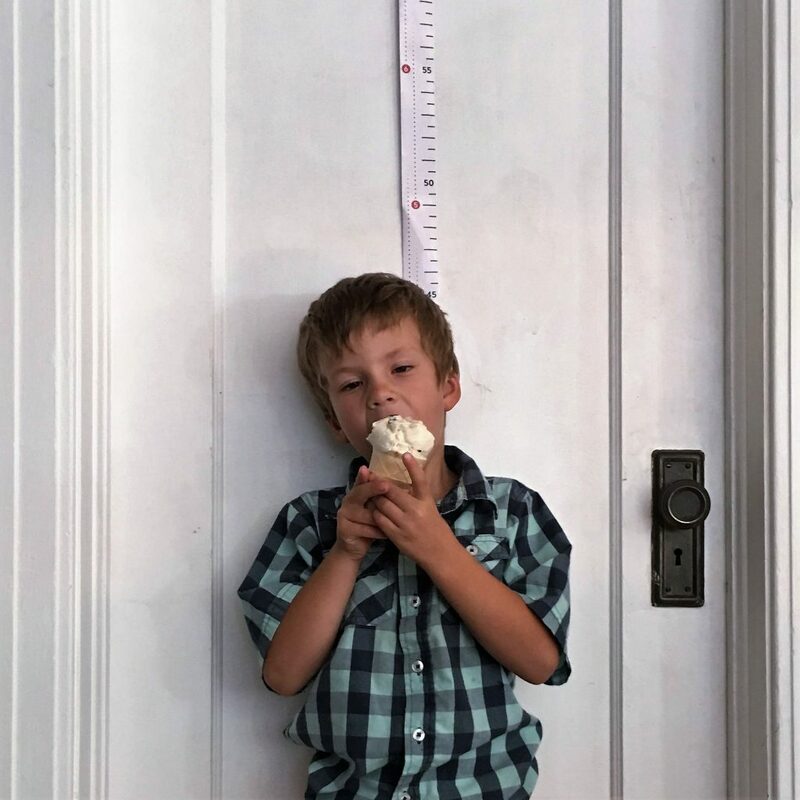 It’s a measuring tape that you can affix to a door or wall and have your child stand next to. 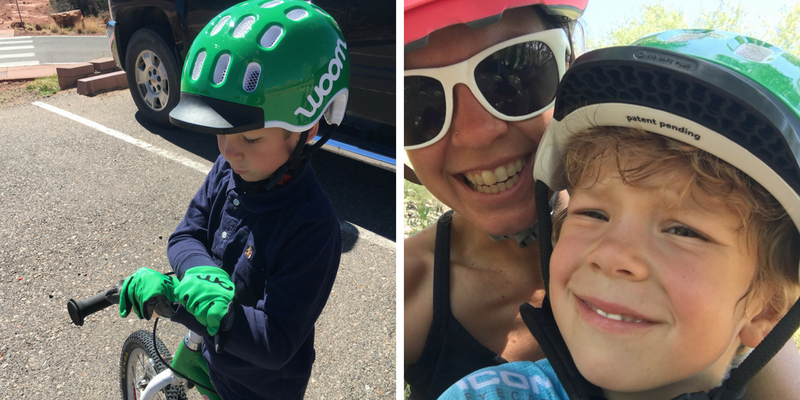 It easily lets you see where in the Woom range your child fits and makes choosing the right size bike a no-brainer. If you don’t want to bother with the size chart, know that the bike is best suited for kids ages 6 to 9 or between 45″ to 49″. We got the bike for my son right around his 6th birthday. Although he’s on the shorter end of the spectrum, he fits comfortably on the bike. If your child is ready for 20″ wheels but doesn’t quite fit on the Woom 4, you might want to consider a bike like the Pello Reddi which has a slightly lower minimum standover height. It’s not often that you see something truly innovative on a kids bike, which is why I was so excited to see the stem on the Woom 4. It can rotate aft and fore, allowing you to adjust both the handlebar height and the reach. For my son, who’s still on the smaller side, we left the stem all the way back. For kids with longer torsos or who are more aggressive riders, you can rotate the stem forward creating more reach. Genius! Woom recently came out with a new kickstand design that we’re LOVING. 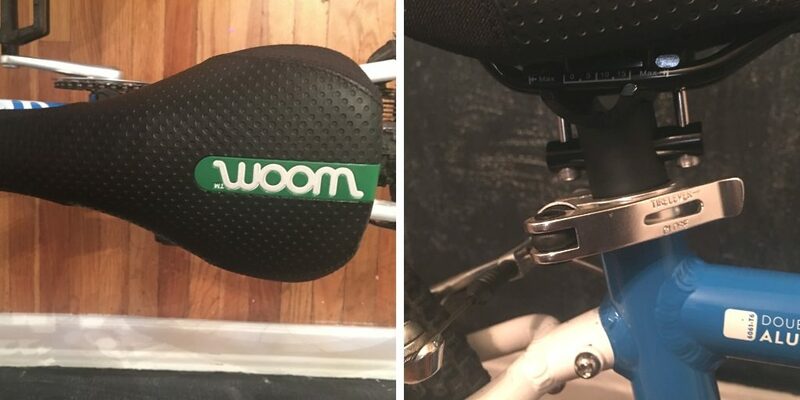 Unlike most kickstands that mount directly under the front chainring and frequently get tangled with the crank arm, the new Woom kickstand mounts to the chainstay. 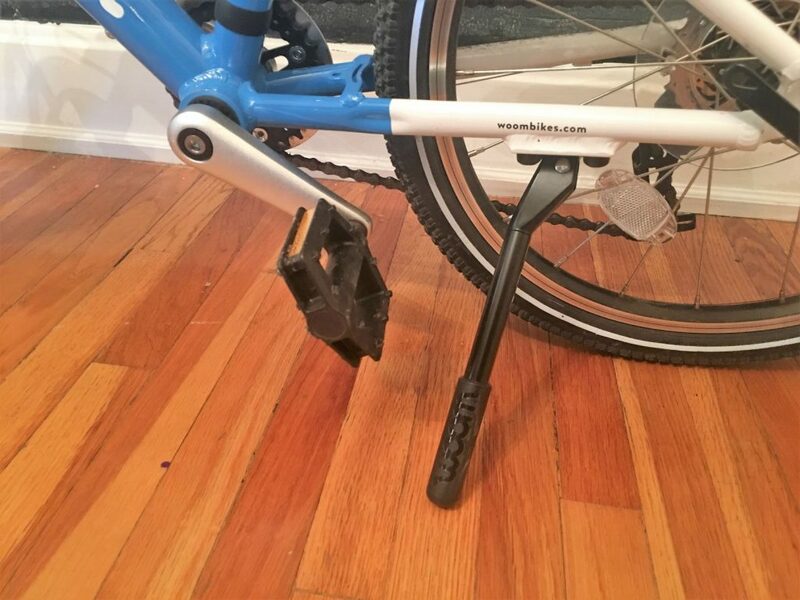 By putting the kickstand further back, it is easier for kids to operate and keeps it out of the way of the crank arm. The kickstand is also beefy. It is about double the thickness of a regular kickstand and does a great job of providing stability and keeping the bike upright. And considering that the Woom 4 isn’t a cheap bike, a kickstand helps keep it off the ground. Sure, kids are still going to beat it up the bike, but a kickstand helps a little bit. We’d highly recommend spending the extra $19 for the optional kickstand. We have lots of grandparents that end up buying Woom bikes not only because they are exceptionally nice bikes, but also because there are so many fun accessories to match. In particular, we love the Woom helmet and the Woom bike gloves. The biggest push back I get when I recommend Woom bikes is how expensive they are. And I get it, they are aren’t cheap. Here’s the thing though: cheaper bikes are HEAVY. They break down faster. You might pay less money, but you end up paying in other ways. 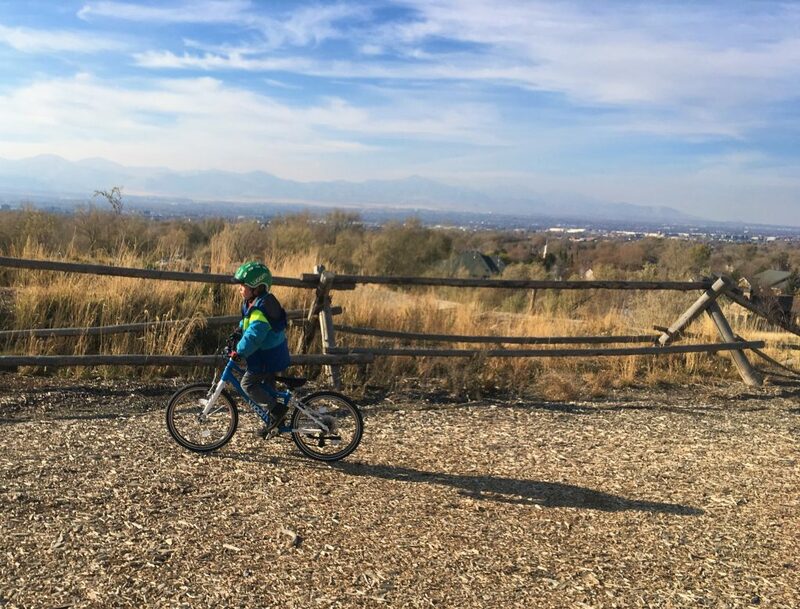 Woom bikes are a good investment in your child’s enjoyment of biking. If you get a heavy, clunky bike, they’re going to have fun riding up and down the street but aren’t going to enjoy going on longer rides. If longer rides are important to you, then you owe them a bike that will make it possible. We’ve seen over several years of use of Woom bikes, that they also hold up really, really well. This means you can safely buy a Woom bike and then hand it down to a younger sibling, or two, or three. If you don’t have multiple children to hand the bike down to, then you’ll still be able to fetch a decent price on the resale market. Demand for used Woom bikes is high. Finally, Woom offers an Upcycle Program. It’s a membership program ($59) that allows you to “trade up” to the next size bike. So after your child is done with their Woom 4, you can upgrade to a Woom 5, and then a Woom 6 later. If you’re not a mechanically inclined person, you’ll be particularly pleased with how easy the Woom 4 is to assemble straight out of the box. We had it put together in well under 10 minutes. (It was probably more like 5). We had the pleasure of visiting Woom USA’s headquarters last year and saw their mechanics building bikes prior to shipment. They take the process seriously and do a great job of pre-assembling the bikes, making sure that everything is properly dialed in and safe. When we got the bike, we had to install the wheels and handlebars, insert the seatpost, and re-attach the front brake. So easy! Unlike many bikes that come boxed, everything was already dialed in and we didn’t have to make any adjustments to the brakes or derraileur. The bike has quick-release axles on the wheels AND a quick-release seatpost collar. We appreciate this so much as it makes adjustments and tire changes so much quicker and easier. 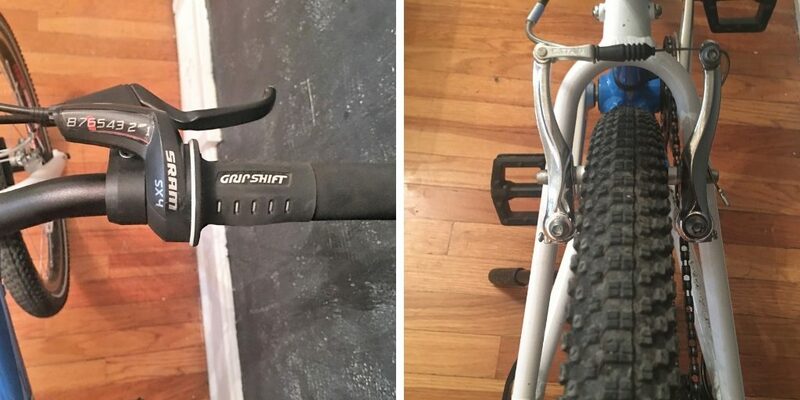 The handlebar grips are a soft foam material similar to the super popular ESI mountain bike grips. They are soft and comfy and add a little extra cushioning which is nice especially if your child is biking on rocky or bumpy terrain. The custom Woom saddle is ergonomic and has reinforced sides for leaning against walls or against the ground. We can safely say that the Woom 4 is our favorite all-around 20″ bike. It’s not cheap, but it is reasonably priced when compared to other high-end 20″ bikes. It also happens to be one of the lightest 20″ bikes, which in our opinion, should be your number #1 priority when buying a bike for young kids. We’re not shy to say that Woom makes our favorite bikes for young kids. The Woom 4 is no exception. It is lightweight, has high-quality parts, and can tackle just about anything. If you want your child to be able to ride faster, go further, and have more fun, the Woom 4 will make that possible.